When we teach students research skills and ways of approaching being a researcher, we know that research is more than just plugging in numbers or following a script. In a statistical analysis, being able to select the variables to use (and not use) and the analysis to answer the question is as important as running the analysis. We want students to design their own questions and analysis. The challenge though is where to get appropriate data easily and ethically? Site has 120,000 data sets that are freely available for anyone to use. They are from ten departments: Agriculture and Agri-Food Canada; Citizenship and Immigration Canada; Environment Canada; Department of Finance Canada; Fisheries and Oceans Canada; Library and Archives Canada; Natural Resources Canada; Statistics Canada; Transport Canada and the Treasury Board Secretariat. 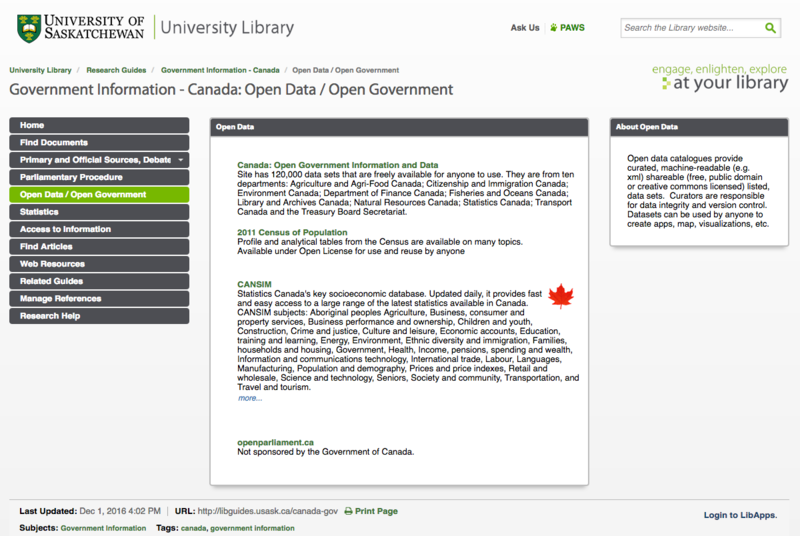 Canada Open Data Pilot Project – “This pilot portal will make more than 260,000 datasets from the following ten participating departments available to all Canadians: Agriculture and Agri-Food Canada; Citizenship and Immigration Canada; Environment Canada; Department of Finance Canada; Fisheries and Oceans Canada; Library and Archives Canada; Natural Resources Canada; Statistics Canada; Transport Canada and the Treasury Board Secretariat. includes the Census of Population and the Census of Agriculture. CANSIM – “Cansim is Statistics Canada’s key socioeconomic database of survey data. Updated daily. FREE as of February 1, 2012. License Information: This is an Open Access resource freely available on the Internet. Systematic copying or downloading of electronic resource content is not permitted by Canadian and International Copyright law. The new Tri-Agency Open Access Policy on Publications came into effect on May 1st 2015. This policy applies to all grants awarded from that day and onward (exception: CIHR has had this policy in place since Jan 1, 2008). This blog post is intended to be a handy, practical introduction to the policy and how to comply. “Grant recipients are required to ensure that any peer-reviewed journal publications arising from Agency-supported research are freely accessible within 12 months of publication” (emphasis my own). Grant recipients can deposit their final, peer-reviewed manuscript into an institutional or disciplinary repository that will make the manuscript freely accessible within 12 months of publication. It is the responsibility of the grant recipient to determine which publishers allow authors to retain copyright and/or allow authors to archive journal publications in accordance with funding agency policies. Grant recipients can publish in a journal that offers immediate open access or that offers open access on its website within 12 months. Some journals require authors to pay article processing charges (APCs) to make manuscripts freely available upon publication. The cost of publishing in open access journals is an eligible expense under the Use of Grant Funds. You do not need to publish in an OA journal – just make sure that the journal you want to publish in complies with the Tri-Agency OA Policy. This means the journal/publisher must allow you to post a copy of the manuscript in a repository within 12 months of publication (often known as the “embargo period”). Check Sherpa/Romeo for publisher’s policies. Carefully read your Copyright Transfer Agreement (CTA) when publishing; negotiate with the publisher to keep the rights you need to post a copy (use an addendum tool). Make sure you post the proper version of the article. Most publishers permit posting of the “post-print” or “author’s accepted version” (the final copy of the manuscript after peer-review and after final revisions have been made). Sherpa/Romeo and your CTA will tell you which version is acceptable to post by your publisher. Currently the U of S does not have an institutional repository, but there are a growing number of disciplinary repositories that you can post to. Search the Directory of Open Access Repositories (OpenDOAR). Posting on your own website is not enough. You must also post in an institutional or disciplinary repository. Although the Tri-Agency has not clearly stated this, it is likely that posting in a social network site like ResearchGate is also not an acceptable route to compliance. Search in the Directory of Open Access Journals (DOAJ). This is a quality-controlled list. Identifying and avoiding predatory publishers: a primer for researchers (PDF). If your chosen OA journal charges a fee for publishing (an “article processing charge”), you can pay this from your grant funding (it is an acceptable expense), or you can apply to the U of S Publications Fund. The Green and Gold routes are not mutually exclusive. If you publish in an OA journal, you can still post a copy to a repository. In fact this is encouraged. Why not have your article available in more than one location? It will increase discoverability, accessibility, and ultimately readership and citations! All of these resources (and more!) 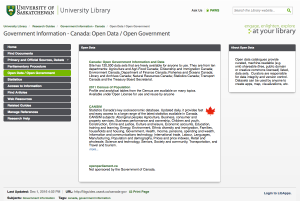 are listed on the University Library’s Open Access Guide. Passive listening and dumping information on exams doesn’t give students the depth of learning and experience that lasts beyond the scope of a course. Having students engage with practitioners and specialists and in a real world environment helps students learn more deeply; chasing grades doesn’t do this but chasing experience does. The elective fourth year course Marketing for Pharmacists is designed for up to 20 students. The course is a project based course where students, working in groups of two to three, work directly with a practicing pharmacist. By working directly with practitioners, on an issue identified by the practitioner, the students learn, in a hands-on manner, about a specific practice site, while the practitioner learns about marketing and how it can be used to enhance practice. In the first year the course was offered there were 20 students, which is the maximum. This year, 6 students were enrolled, and as a result it could be run much more as a seminar. Half way through the course I thought (out loud), based on the enriching discussions around current events in pharmacy, if I was thinking we would’ve written a manuscript on these issues. The students came back a week later and said “can we do this?” I said only if all of you are willing to be involved. They said yes, so I approached a journal to see if they would be interested in an article surrounding our class discussions; the journal responded indicating their interest. After working on the article as a group, and in consultation with myself, we submitted the manuscript for peer-review to the Canadian Pharmacists Journal at the beginning of December. In early January we received notification that our manuscript was accepted for publication, but required some minor revisions first. Since the students were not in the course anymore, and were out on experiential learning rotations across the country, I wasn’t sure if I was the one that would be completing the revisions; however, the students jumped at the chance to revise the manuscript, and even spoke of how they learnt, from the reviewers, how the manuscript can be enhanced. This allowed the students to experience the entire process, from the idea, to the research and drafting of the manuscript, to receiving feedback from peer-reviewers, and ultimately to acceptance. The manuscript was accepted the day after the revised manuscript was resubmitted, and will be published in the May/June 2015 issue. I am not sure if this would work as well as it did, especially since it arose – after the course was half completed – from an organic process of critical thinking and discussion in class, with a different group because the maturity of the group and their willingness to cooperate was very high. As a sign of maturity, at the beginning of the course when students are to form groups of their choice, all agreed they were willing to work with anyone in the course (despite not being in the same ‘clicks’), and therefore I put all of their names in a hat and randomly selected members of each group. Some students want to do this sort of a project and these students are the ones working on projects before they even start the course. If enrollment increased, it would be harder to ensure all papers got published and this could lead to disappointment for the students. A smaller class allows full participation in the publishing process, and in the course as a whole. Context is incredibly important in making this work. For some students in this college marks are not as important as experience and peer-accountability is in motivating them to first enroll in the course, and second engage in the course and project. This sort of course gives students a different experience from traditional pharmacy courses, and brings recognition to other concerns such as how marketing can be used to better meet the needs of patients and the health care system as a whole. This is the first course of its kind in Canada, and provides those students that take the course the ability to learn a unique skill set that is not readily available once they enter practice; there are only a minimal number of continuing education opportunities in the area of marketing. I’ve been a teacher since I was 6 years old and I still absolutely grin when I see a class that is well-structured and flows with lots of student and instructor excitement and enthusiasm that is “on purpose.” When the class time flies by, things are “accomplished,” there’s action, and “learning” is palpable, that is what we strive for, and to me it’s as beautiful as a great movie, a heart-felt song, or a painting that claims your attention. I saw these qualities in a 50-minute class taught by Leah Ferguson, a new faculty member in Kinesiology. I was absolutely grinning by the end of the class so I asked Leah if I could interview her to find out more about how she planned for it…Just so you know, this was an 08:30 class that started at 08:31 with all seats full and only one student coming in very shortly after things got underway. Where Do You Get Your Examples? This might surprise you at first but then it’s an “of course! !” What a way to make research real, build a sense of collegiality, highlight what’s going on in the college, and let students know about the research of their other professors. The real examples from the college make the concepts come alive! The interview is about five minutes…let us know what you think.